A traveler, lost on a rainy night, stumbles across a monastery and takes shelter there. Fortunately, she's just in time for dinner, which turns out to be the best fish and chips she's ever had. After dinner, she goes into the kitchen and asks "Excuse me, but who cooked that meal?" Two of the brothers step forward in response. "Hello, I'm Brother Michael, and this is Brother Charles." "Pleased to meet you both. I just wanted to thank you for a wonderful dinner." Both brothers smile and murmur "Thank you, our pleasure." "Out of curiosity, who cooked what?" Brother Charles said, "Well, I'm the fish friar." She winces, turns pale, and says to the other brother, "Oh, no. Then you must be..."
It says, "I hate resetting it for Standard Time." Hurray! We get to set our clocks BACK tonight!!! 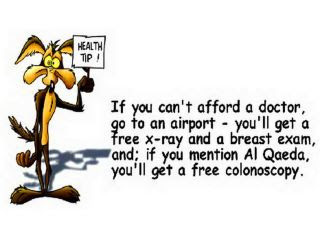 I like the idea of going to the airport instead of the doctor for my annual exams, though there are pros and cons - Pro: You don't have to wait weeks for the results. Con: There is still a two hour wait at the airport, but you have to stand in line. No cushy waiting room with magazines to thumb through. I'm one that just wishes we could leave the clocks alone. It takes me about 2 minutes to change the house clocks and two months to change my body clock. Ha, I like the doctor cartoon too. Hadn't seen that before. You have some tough polls up. I like dancing, knitting, bicycling, AND kayaking. I went with dancing though. Looking forward to seeing you later today!